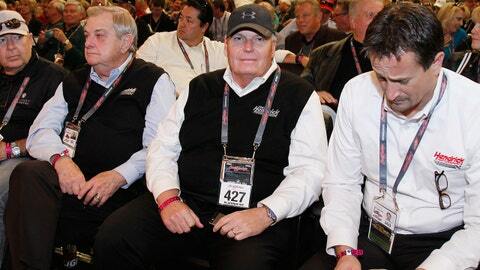 Rick Hendrick was a busy man at the 43rd annual Barrett-Jackson Scottsdale Collector Car Auction. The NASCAR Sprint Cup team owner and car dealer bought and sold an impressive number of cars over the week. Hendrick brought at least 21 cars from his Hendrick Performance division. All 21 sold during the week at Barrett-Jackson, raising a total of $1,455,000. But what Hendrick spent far outstripped what he bought. Among the cars he purchased at Barrett-Jackson was the first production 2015 Chevrolet Camaro Z/28 for $650,000, with all the money going to charity, specifically Cornerstone Schools in Detroit. The first production 2015 Chevrolet Camaro Z/28 crosses the block at Barrett-Jackson Scottsdale. A native of Southern Virginia, as a youngster Hendrick was a huge fan of drag racing legends Sox & Martin, who hailed from the nearby Burlington, N.C., area. Saturday at Barrett-Jackson, Hendrick paid $198,000 for a 1968 Sox & Martin Hemi Barracuda race car in the team’s iconic red, white and blue livery. 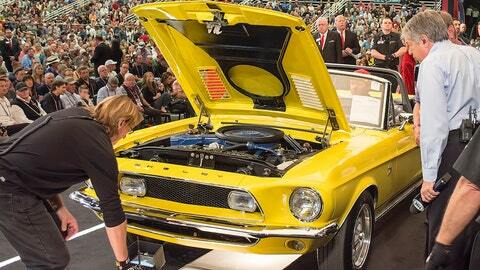 Hendrick also bought a rare yellow 1968 Shelby GT 500 KR convertible, one of only 43 made in this color, for $308,000. Rick Hendrick looks on from the front row before buying this rare 1968 Shelby GT 500 KR convertible. There were other purchases made by Hendrick but his biggest score was the four-vehicle "Snake and Mongoose" Hot Wheels set owned by Don Prudhomme – Two race haulers, Prudhomme’s fully functional 1970 Plymouth Barracuda Funny Car and Tom McEwen’s 1972 Plymouth Duster Funny Car show car. 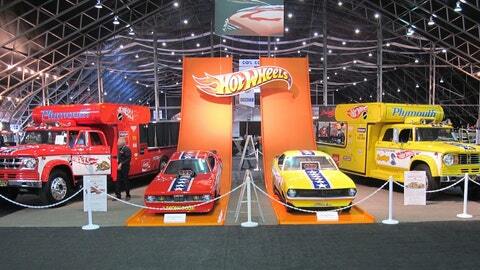 Team owner Rick Hendrick became the proud new owner of the famous four-vehicle "Snake and Mongoose" Hot Wheels set. The package was bid to $1 million and initially was a no-sale on the block, but Hendrick and Prudhomme negotiated a private sale afterwards. 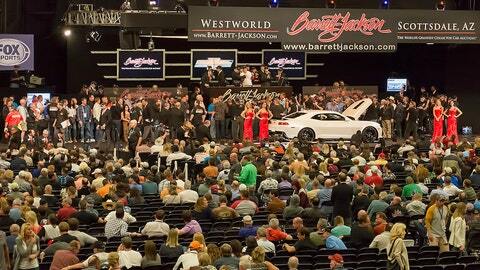 Barrett-Jackson’s website lists the sale price as $1 million total. Regardless, it was a huge week for Hendrick both buying and selling. And he was impressed with Barrett-Jackson’s huge new facility. "It’s unbelievable the amount of room, all the cars, the way they’re displayed. It’s really neat," said Hendrick. "I looked at the crowd Tuesday night and it was like a Friday night crowd. It’s just bustling. There’s a lot of people I haven’t seen before, a lot of people I see every year. And a lot of cars — a lot of cars."